The Innocent is the first novel in a trilogy featuring our heroine Anne, and taking place in medieval Britain 1450 during the reign of King Henry VI and soon, King Edward IV. This novel of historical fiction takes place during the War of the Roses and combines adventure, romance, and intrigue into a work of art. The Innocent is one of the best novels I have read so far in 2010. Anne is beautiful, intelligent, and modest, and possesses knowledge of how to cure illnesses with herbs and natural ingredients. 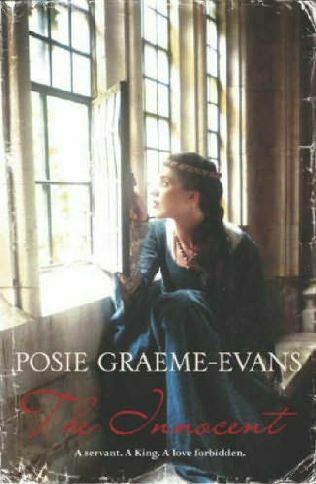 Because of her healing gift, she is dispatched to the court of King Edward IV to help cure the queen. Amidst life at the palace, Anne catches the king's eye and soon they begin to fall in love. Anne's true identity in terms of her bloodlines is soon revealed, which sends the plot into a whirlwind of directions. Posie Graeme-Evans has written an exquisite piece that is just too good to put down. Anne's character is so likable and admirable because she really is a good-willed and angelic person. As readers, we want the best for her! The author also sketches all other characters with brilliant color; especially Queen Elizabeth Woodville and Doctor Moss. We are made privy to all characters' thoughts both nasty and pure. In addition to detailed character development, the historical facts weaved into this fictional novel are well-thought out and accurate in comparison to documentation. As always, we learn about history much more effectively than simply reading out of a textbook because of how the story is put together. Graeme-Evans also writes every scene with explicit detail; whether it be sexual or violent. 'Colorful' really is the best way to describe this book! For all historical fiction fans, The Innocent is a must-read! The next two books in this Anne series are The Exiled and The Beloved , which can also be found listed under the alternate title The Uncrowned Queen . I've got both titles on my wish list for immediate future reading.